Great Food. Excellent Spirits. Good Times. It all started with a vision of the transition from a pub atmosphere to a polished, casual restaurant that offers a large selection of imports, micro-brews, and draft beer. Ale House 1890 will be serving 'made-from-scratch' food using locally grown ingredients in a comfortable setting everyone can enjoy! We love our city! That's why we love to keep our history alive! Ale House 1890 will also continue to be involved in community events just as we were when we were Ale House 1890. This includes the Art Walk, Chocolate Walk, etc. We will keep events posted on our events page and continue to keep you informed via social media and our newsletter! Before we were Ale House 1890, we were The Minute Bar! Our customers would come knowing we offered a comfortable setting where they could enjoy a nice drink, good food and relax with friends. The Minute Bar also got involved in events held downtown such as the Art Walk, Chocolate Walk, etc. We will be bringing our same passion and dedication to bringing you the comfortable setting and great times into Ale House 1890. The Minute Bar will always be an important stepping stone towards our future as Ale House 1890! The history of the 149/151 Main Street locations has great saloons and people in a great town. 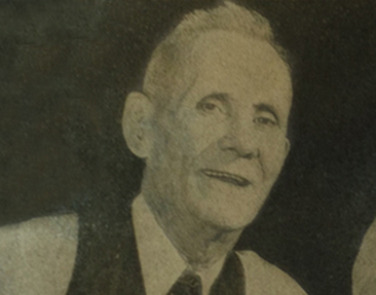 Jerry Maher (pictured above) had purchased the 151 side in 1904 when it was a saloon. During his time there, the building had not only been a saloon, but also a dressed meat shop during the Prohibition. While we know that side of our restaurant has been around since 1890, we uncovered some evidence that the other half, 157, has been around since at least 1869! These saloons may have seen the changes of technology, products and the people who visited them, but the spirit of community and good times has remained constant to today. You can read more about Jerry Maher here.